Eggs are nature’s perfectly packaged nutrient and protein rich little gift. People used to avoid egg because they were told the yolks were high in cholesterol. Now research has found that eggs also raise the good cholesterol that our bodies need. So I’m not saying go all ‘Cool Hand Luke‘ on me, but enjoy eggs regularly, don’t fear them! It almost seems ridiculous to call it a “recipe”. So call it a reminder. 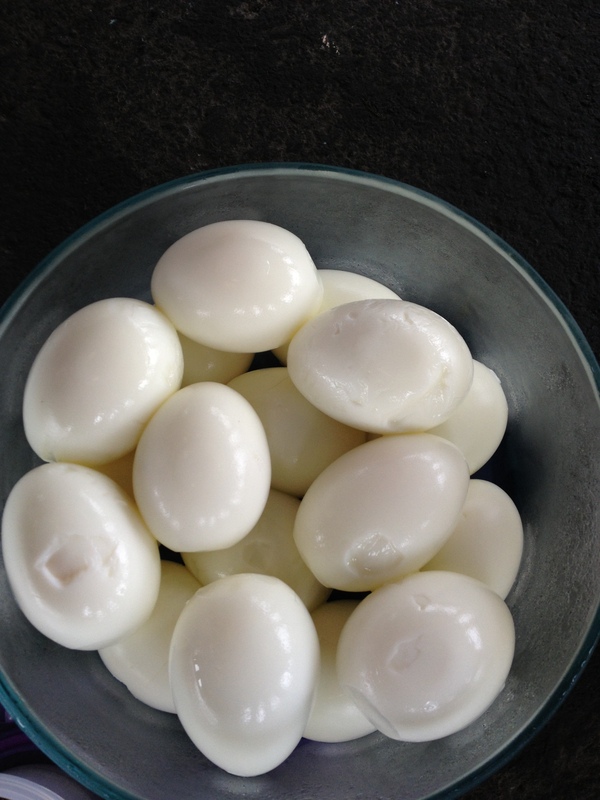 Hard boiled eggs are your healthy, cheap, quick breakfast, snack or protein fix. Grab and go on your way out the door, or put ’em atop a salad for added protein and to keep you fuller longer. Make a batch to enjoy at your own pace, they’ll keep in the fridge for 5 days or so. 1. Put the eggs in a single layer in a saucepan, covered by at least an inch or two of cold water. Starting with cold water and gently bringing the eggs to a boil will help keep them from cracking. Previous Previous post: RECIPE: Power Balls!